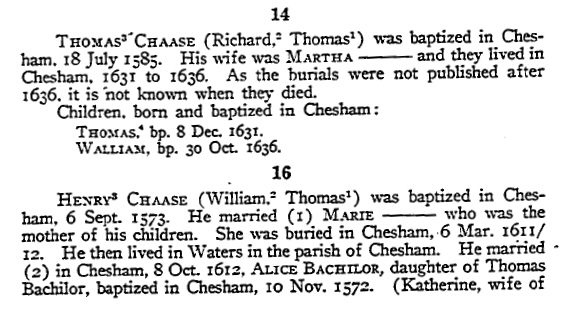 Richard CHASE (1542 – 1611) was Alex’s 14th Great Grandfather; in the Shaw line. 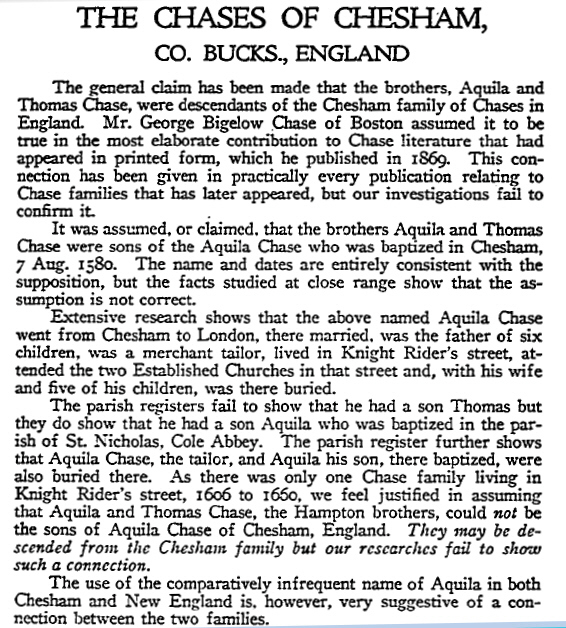 I usually don’t take this record past the immigrant ancestor or his parents in the case of immigrating siblings, but in this case, William CHASE, Aquila Chase and Thomas Chase might have been cousins with Richard as their common grandfather. We don’t know for sure which have Richard’s sons might have been their father. Richard Chase was born 26 Jul 1542 in Hundridge, Buckinghamshire, England. 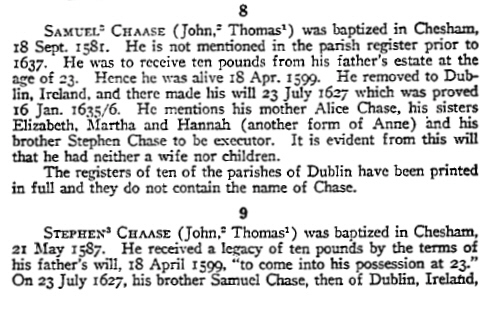 His parents were Thomas CHASE and Elizabeth BOWCHIEW. 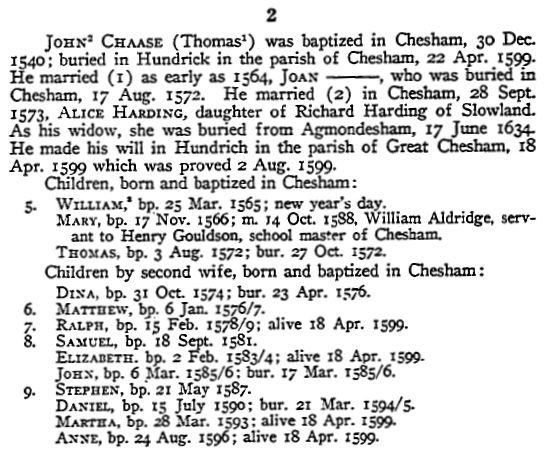 He married Joan BISHOP 16 Apr 1564 in Hundrick Parish Chesham, Buckinghamshire, England . 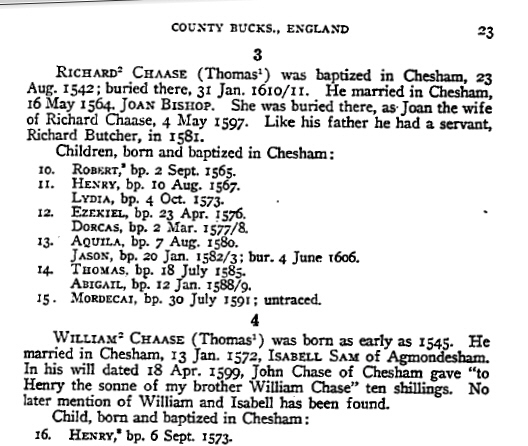 Richard died 31 Jan 1611 in Chesham, Buckinghamshire, England. in St Nicholas Cole, Abby, London, England. 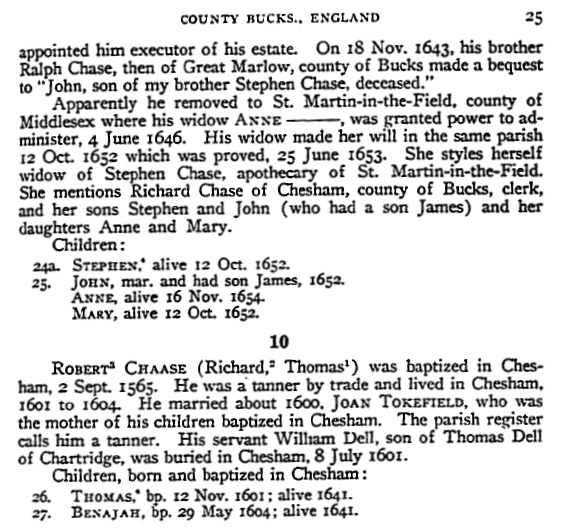 Like his father, Richard had a servant Richard Butcher in 1581..
Robert’s wife Jean Tokefield was born 1565 in Chasham, Buckinghamshire, England. Her father was Richard Tookefield. Robert was a tanner by trade. 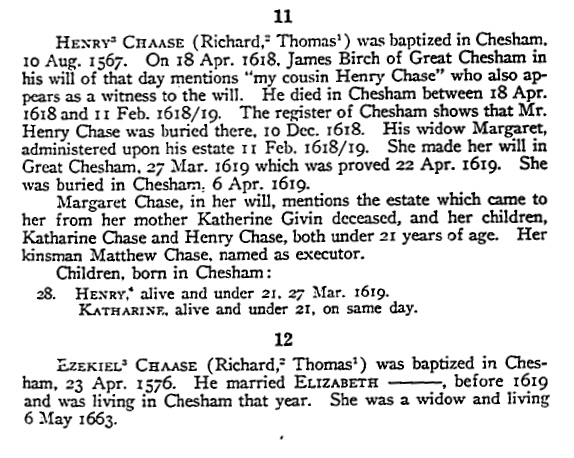 Henry’s wife Margaret (Marie) Given was born 1592 in Hundridge Parish Chesham, Buckinghamshire, England Marie died 6 Mar 1611/12 in Chesham. Alice Bachilor was probably the wife of Henry’s cousin of the same name. Alice was born 1569 in Hundridge Chesham, Buckinghamshire, England. Her parents were Thomas Bachelor and Katherine [__?__]. Ezekiel’s second wife Elizabeth [__?__] was born 1580 in Chesham, Buckinghamshire, England. 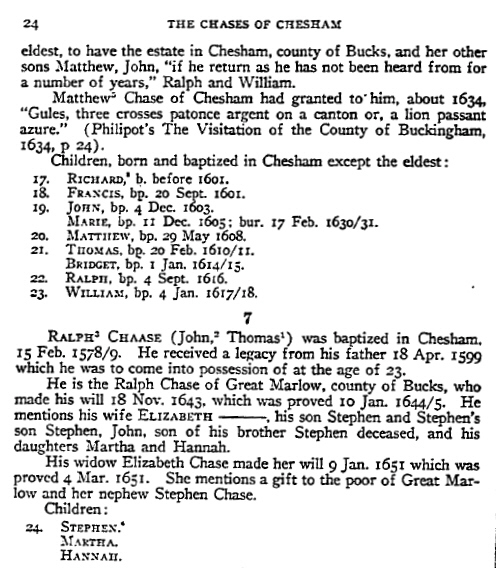 She was a widow and living 6 May 1663. 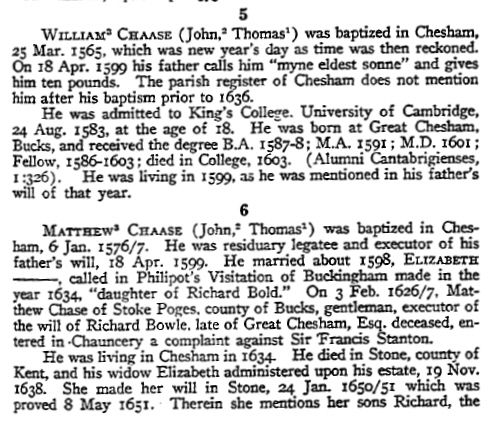 Thomas’ wife Martha [__?__] was born in 1590 in England. 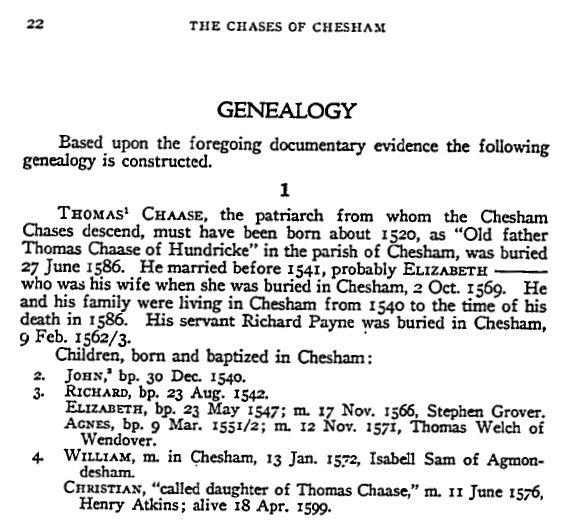 They lived in Chesham from 1631 to 1636. This entry was posted in Line - Shaw. Bookmark the permalink. your sight is the first one to make since with the vital records I have uncovered thanks. Coat of Arms removed, at the time John Davys was not part of the gentry and he did not have a coat of arms when his children and grandchildren came to America.